The Church of Man-made Global Warming claims all the snow falling this winter is a result of greenhouse gases. Some NASA pseudo-scientist said this in an interview. We have proof these pseudo-scientists have falsified data to support their fraud. They arbitrarily raised the temperature reported by sensors around the world. They were caught when someone else checked the raw data for those sites and the results didn’t match the claims of the pseudo-scientists. 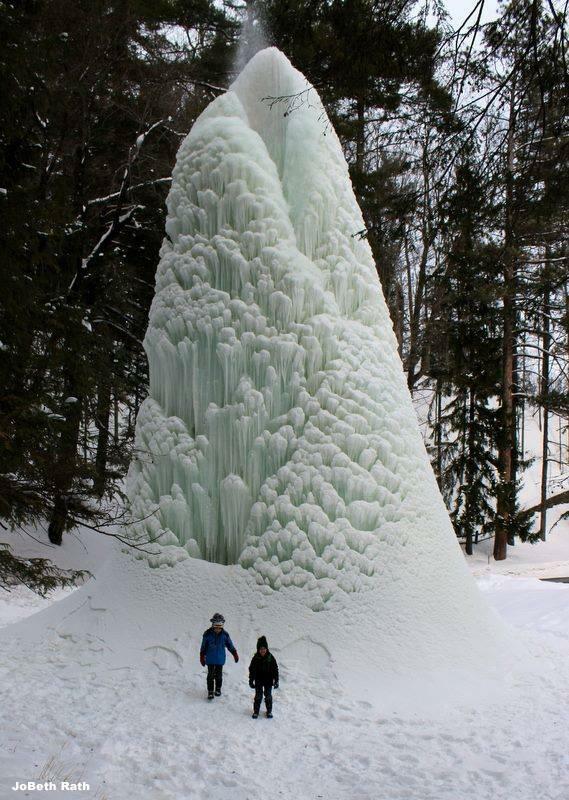 Park officials tell local media that the formation dubbed an ice volcano is at least 50 feet high. — MyFoxNY. NATO, or perhaps, just the EU, appears to be on a collision course with Putin’s Russia. After a shaky ceasefire between the Ukrainian government and Russian surrogates masquerading a rebels, the war of words has shifted further west. The fraught relationship between Russia and the West, which was supposed to improve following an agreement over Ukraine, has descended instead into renewed acrimony after a series of tense military and diplomatic confrontations. France and Germany, which had brokered the Minsk accord last week, were yesterday trying to hold together the increasingly fragile ceasefire in Ukraine amid reports that fighting was spreading once again. Kremlin-backed separatists and Cossack fighters triumphantly paraded through the shattered town of Debaltseve, a strategic point they had captured in the past 48 hours. Britain, which along with the EU will be strongly criticised by a House of Lords committee today for “sleep-walking into this crisis”, was drawn towards centre-stage after two Russian Bear bombers off the coast of Cornwall – but just outside UK airspace – were met by RAF jets scrambled from their base in Coningsby, Lincolnshire. British Defense Secretary Michael Fallon, speaking before Parliament, “accused President Vladimir Putin of trying to extend his campaign of destabilisation to the Baltic countries. The Russian leader, he said, presented as much of a threat to Europe as Isis.” — The UK Independent. Amid this discussion, there is one glaring omission: any comment from the United States. “The US administration has put on hold a decision on whether or not to supply the Ukrainian government with heavy weaponry; White House spokesman Eric Schultz said.” — The UK Independent. After decades of dependence on the US military to safeguard their countries, the EU and other European nations have suddenly realized they are defenceless against Putin’s aggression. Europe has allowed their Cold War militaries to wither, failing to maintain their contributions to NATO and now, when that NATO strength may be required, it no longer exists. Europe depended on the United States for protection but now, suddenly, that dependence has proven to be fool-hardy amid Obama’s incompetence displayed around the world. Words, actions, have consequences. Marie Harf has been presented with this lesson. After her farcical response to a question about opposing ISIS with a Jobs program, her self-generated controversy has cost her a promotion. Jen Psaki might be getting the call to the big leagues, but that doesn’t mean Marie Harf is taking her old spot. After a multitude of ineffective television appearances, headlined by her remark that helping ISIS fighters find jobs instead of killing our way out of war against the terror group should be the U.S.’s priority in the Middle East, Harf is not in line to become Psaki’s replacement as the top spokesperson at the State Department, according to a Daily Mail report. A source told The Mail that Harf “failed spectacularly” during her “test run” for the top spokesperson job, as Psaki’s move to the White House had been in the works for some time. Will Marie Harf learn from this lesson of life? I doubt it. She is still the poster-girl for every blond joke ever told. State Department Spokeswoman, Marie Harf. I listened to the interview given by State Department spokesman, oops, spokeswoman, Marie Harf. After listening to her babble for a bit, I was struck with the realization that Ms Harf was the source of every blond joke I’ve ever heard. She continued to be the poster-girl of blond jokes by claiming, later to critics of her statements, that her remarks were, “too nuanced,” for the common people to understand. …you’re a target of any fool blathering nonsense that comes down the road. There’s more truth in that statement than many people realize. Obama spoke at the National Prayer breakfast and made a fool of himself. That, in itself, is not surprising. What was surprising was his logic that gave a pass to the atrocities committed by ISIS. What did Obama do? He compared the atrocities committed by ISIS to the Crusades, the last Crusade occurred around 700 years ago, and the Inquisition. The worst acts by the Inquisition occurred around 500 years ago, although the office of the Inquisition wasn’t abolished until after the Napoleonic Wars. The ISIS atrocities occur NOW! 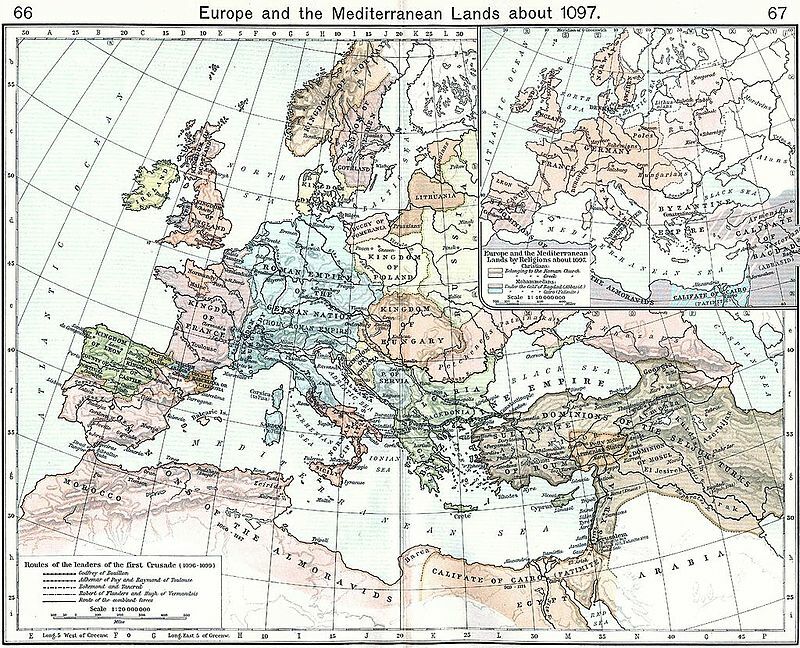 Map of Europe and the Mediterranean Lands, Circa 1097. The first Crusade began around 1095 supposedly in response to a plea for help by the remnant of the Byzantine Empire. The Muslim Seljuk Turks had invaded the Byzantine Empire and the Empire was losing. The Empire lost the battle of Manzikirt in 1071. After that battle, the Turks proceeded to seize most of what is known today as Turkey. The Catholic Church in Rome gave little thought to the Byzantine request. The “Eastern” Empire formed when the Roman Empire split. It also created a schism in the Catholic Church. The Roman Catholic Church, under the Pope, remained in Rome. The Eastern Church, later known as the Greek Orthodox Catholic Church, resided in Byzantium, modern day Istanbul. According to many historians of that period, the pleas from Byzantium were not the primary motivator of the West. After winning the battle of Manzikirt, the Seljuk Turks proceeded to consolidate their new territory. They did so by slaughtering any Christian, Pilgrim and Jew they found or forcing them to convert to Islam. They had done the same, previously, when the Seljuk Turks seized Jerusalem a few years earlier. In 1065 the Seljuks began a campaign of persecution against Christian pilgrims in the Holy Land in which the Bishop of Bamberg and 12,000 pilgrims were massacred by the Muslims only two miles from Jerusalem. — Crisis Magazine. News traveled slowly in those days. The massacre at Jerusalem was still fresh in the minds of the Cardinals and the Pope in Rome when the plea from Byzantine Emperor Alexius I arrived. By that time, the Church was already in the process of calling for a Crusade to free Jerusalem and resume the Pilgrimages. In all, there were eight crusades from the first in 1095 until the last in 1279 with the Invasion of Tunisia by King St. Louis IX of France. The later Hapsburg-Ottoman Wars are thought by some to be a continuation of the Crusades by the Muslims of the Ottoman Empire. The Muslim invasions of Europe continued for another 300 years after the Eighth Crusade culminating with the Battle of Vienna in 1683. Remember that date—1683! It was just 100 years before the end of the American Revolution. Muslim aggression was more recent that many now realize. Not only more recent, but also much earlier than many know. In fact, Muslim forces invaded Europe well before the first Crusade, seizing modern day Spain and marching deep into France. The Crusades were the result of Muslim acts of atrocity and in response to Muslim invasions of Europe. How many know that today? Is it being taught anywhere? It was a fifteen-minute discussion when I took Western European History in college. I had intended to include a history and background of the Inquisition but that will have to wait for another day. Just one bit of information, the Inquisition wasn’t just in Spain. It covered most of Europe and throughout the Holy Roman Empire. If/When you listen to Obama’s pack of lies from the National Prayer Breakfast, read this and know the truth. Obamacare is in force. Not surprisingly, there are…issues. Yeah, let’s call them issues, it sounds so innocuous. It seems some hospitals, attempting to use Obamacare, had problems. A surgeon, attempting to get permission to perform a surgery, spent hours trying to verify a patient’s insurance…and finally gave up. Paperwork problems almost delayed suburban Chicago resident Sheri Zajcew’s scheduled surgery Thursday, but Dr. John Venetos decided to operate without a routine go-ahead from the insurance company. That was after Venetos’ office manager spent two hours on hold with the insurer Thursday, trying to get an answer about whether the patient needed prior authorization for the surgery. The office manager finally gave up. “I’m not a happy camper,” said Nate Zajcew, the patient’s husband. The couple signed up for a Blue Cross Blue Shield bronze plan through the federal HealthCare.gov site on Dec. 16. — CBS News. In other locations, people arriving for care at some ERs were left in frustration because the ER could not verify their insurance. ‘They had no idea if my insurance was active or not!’: Obamacare confusion reigns as frustrated patients walk out of hospitals without treatment — UK Daily Mail. No, it’s not an auspicious rollout for Obamacare. In fact, it’s so bad, the rats are jumping ship. A second Obamacare official quit this week. PORTLAND, Ore. – The man who led Oregon’s problem-plagued health insurance exchange has submitted his resignation. Rocky King has been on medical leave since Dec. 2. His resignation is effective at the end of his leave, March 5. The news came in a letter sent by King to the board of Cover Oregon on Wednesday. The board wrote to the agency’s staff on Thursday that it would begin looking for a permanent director. King is the second official connected to the exchange to resign. He came under fire when the online enrollment system failed to go live in October. Technical problems with the exchange have been an embarrassment to the state and forced Oregonians to apply using paper applications. The state had to hire or reassign nearly 500 people to process applications by hand. — FOXNews. Even for libs, it is not going well. A woman, an icon for publicizing Obamacare was astounded to discover she could not afford insurance under Obamacare as she assumed. PORTLAND, Ore. (CBS Seattle/AP) — One Oregon mother says that she is unable to afford health insurance for her and her 18-month-old son because it’s too expensive. Kate Holly, 33, tells KOIN-TV that she originally championed President Barack Obama’s signature health care law because she thought it would help people in her situation. Holly is hoping things work out but she doesn’t know if she will have health care for her and her son. “I guess I’m hoping that I will find out there’s a way around this, but I don’t know yet,” Holly told KOIN. It’s always a wake-up call to libs when they discover their assumptions are nothing more than vapor. Reality bites.